After adding 3 experimental features related to labels, Gmail Labs has 3 new features that deal with replying to messages. "Quote selected text" changes Gmail's replying behavior and it lets you include a selection from the original message. This is especially helpful when you reply to long messages from people who don't use Gmail. Your reply will only include the necessary context, not the entire message. This experimental feature works only when you use the keyboard shortcut for replying (r), not when you click on "Reply". "Reply to all" changes the default replying option when you receive messages addressed to more than one person. Instead of replying only to the sender, the default option changes to "reply to all". Just make sure that your reply is really useful for everyone. "Vacation time" is an enhancement of the vacation responder that lets you enter when you intend to go on vacation. This way, you won't have to remember to turn on the vacation responder. "While planning my own vacation, I didn't want to worry about composing, starting and stopping my vacation auto-response while I was on vacation. Call me a purist, but that defeats the whole point of being on vacation," explains Darick Tong, the author. What other features would you like to see in Gmail Labs? ... I would like not to have to set the font each time... thank you. Make the contacts available while off line. I know that in Evolution Mail (Gnome app) I can easily sync my Gmail contacts. I can only assume Thunderbird/Outlook has the same capability. i would love to have the option of entering a calendar event all the time. if there could be a button that asked me if i wanted make this email a google calendar event it would fantastic. I wonder if these will work in iGoogle. The most basic features, like 'reply' do not. I would like to be able to "snooze" emails. Have Gmail hide emails for a specific time, and then let it pop into my mailbox again. 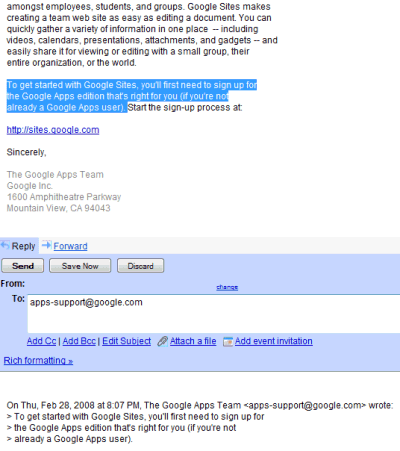 Gmail Labs for Google Apps fixed. It can't be so difficult, can it? I would like to have the choice between multiple signatures. I'd love the ability to turn Conversation view off. (i.e. the threaded view.) Several of my Apps users have complained about it, and for certain things like mailing lists it mangles the thread, making the list really difficult to read. 'Reply to all' is a feature in *testing* in Gmail Labs?! LMAO!!! No, smartass. "Reply to all as a default option" is a feature in *testing* in Gmail Labs. I want to be able to attach another mail. And to attach a Google Doc or Spreadsheet. "Anonymous said on September 11, 2008 3:34 PM PDT: ... I would like not to have to set the font each time... thank you." I second that. Changing the default formatting (font, size, color, etc.) would definitely be a plus. The thing I want most as a "reply-tweak" would be the option to reply without quoting anything from the previous message(s). It's a feature already available in the 'basic HTML' interface. Or is this possible with the first Lab feature released today? I also like the idea of "snooze" an email, so i can't forget to reply. "Mark all as read", like in Google Reader. The way things are going, I'm guessing Google will soon figure out a way to detail my car for free while also seeing their stock price soar. Again, I would like to bring the following into the discussion. I want to see a To: field that is interactive with the sender...one that pops up an address book showing you all of your contacts. Sometimes I forget people that I want to forward an email to. At-any-rate, read my blog post here for further information. bottom posting and different signatures for different accounts. I am sooooo frustrated. I can no longer acess links within emails. I am not a computer guru, but why would igoogle do this? I liked the old system- super easy to use and better integrated with google products. I had to reset my computer to manufacturer standards. The first time I went straight to gmail the links worked again. Then when I went to igoogle...well...that was it....no links working within gmail again. I HATE the new platform- no longer a truly custom page either. this has to be fixed - and fixed so that non-techie types like me can use igoogle again! Good to know about newly added features. I get emails that need a standard reply. I cannot use autoreply as there is no filter I can use to set the auto reply for this. I would like to select multiple mails and send one reply. This reply should go to each of the mails individually. Let me know if this can be achieved by any other means. Anybody knows what happened with this lab??? They just wiped it out?? You didn't read the fine print: "Gmail Labs is a testing ground for experimental features that aren't quite ready for primetime. They may change, break or disappear at any time." graduate from Labs and become regular features. " I think people were simply having problems by accidentally sending messages to too many people. But that's their problem! Default send-all should be an option, not a lab. It's only natural to assume when you send a mail in a thread you send it to everyone and not just the sender. I miss this feature. Will it come back? I can't believe they removed it because some people had problems with the very function of that Lab. If you don't want a default 'Reply to all', just disable it! Google! Do not punish the whole world because a few twits cannot manage "Reply to All"
Bring back reply to all, Its ruining my pointless 3 way conversations! Ugh...I was really loving the default reply all. Now, since Reply is the default, I forget to copy people and it is a pain. So sad. No more "REPLY-ALL" now. They have disabled this great feature. Another vote to PLEASE BRING IT BACK! I think its great and especially helpful when replying to long messages to people who don't use Gmail. It was so nice to just be able to click on the big text area, before I generally forgot to copy it, then after a few months with this lab, I never remember everyone. And then it takes another two emails to get back on track, and have everyone on the same page. Another vote for having Reply to All back asap! I want "reply to all" back. I too want "reply to all" back. Ridiculous! Default Reply To All was my absolute FAVORITE feature. "We are no longer selling bubble gum because some people get it in their hair when they blow big bubbles!" I add my voice to those crying out for this feature. Those who are having trouble should simply NOT ACTIVATE IT. How hard is that? "WARNING: This feature is not for idiots. If you are an idiot you are NOT authorized to use Reply To All. You must answer the following question to continue. Please give us back the option to reply to all by default. All together for "Reply to all " by default option ! GIVE US BACK "Reply to all" !!! GIVE US BACK "Reply to all" !!! STOP IDIOTS, USE YAHOO !!! All FRANCE with "Reply to all" option ! FRANCE For Change ! I would like to see a visual clue about emails I've already replied to. I send out emails to a group of 300 people. When 26 reply in one day I need to know who I've already replied to and who I haven't without trying to correlate the long list of responses and replies for each original topic. If I can't do this, this email is worthless to me. I saw this reply to all feature awhile ago, but now i can't find it. Seems you've done a good job at hiding it. That's unuseable for me, and the reason that I only use my gmail account with thunderbird instead of the web interface, even though I like a lot of the features in the web interface. Bummer. Ho and btw, @Brent212 : gmail quoting is just how I like it. I dislike Outlook quoting style you propose. @ Jerome: So you like not being able to tell who previous emails were sent to in a chain where you were added in somewhere down the line, and you like having the quoted emails looking like crap because there's like 10 levels of inconsistent indentation with some messages using it (like ones from gmail addresses) and others not using it + screwy wrapping effects? Weird. I still would prefer it if they gave us an option of switching it. Choice > no choice, always. How do you do away with a feature of efficiency, like "Reply to All?" They pretty much showed their cards in rather than outsmarting the digression of it's use, they had to succumb and do away with it. Weak! I've written a small extension that allows to make outlook style replies. The extension does full formatting and thus the message looks decent in Gmail AND in Outlook of the recipient. was so simple and usable: the graphical replacements don't work nearly as well, partly because you can't enter them manually. But I can't find any options in Gmail for changing this - am I just being thick?